Last year I picked up a couple of fascinator/ millinery books to look through. 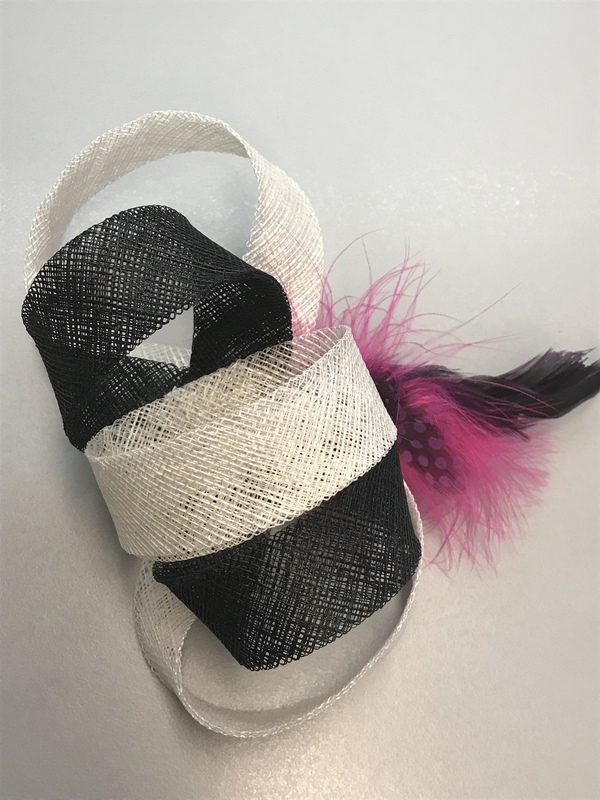 For the upcoming Kentucky Derby, I decided to make my mom and I a fascinator using Hannah Scheidig’s book “Fascinators: 25 Stylish Accessories to Top Off Your Look”. The first fascinator was for my mom. 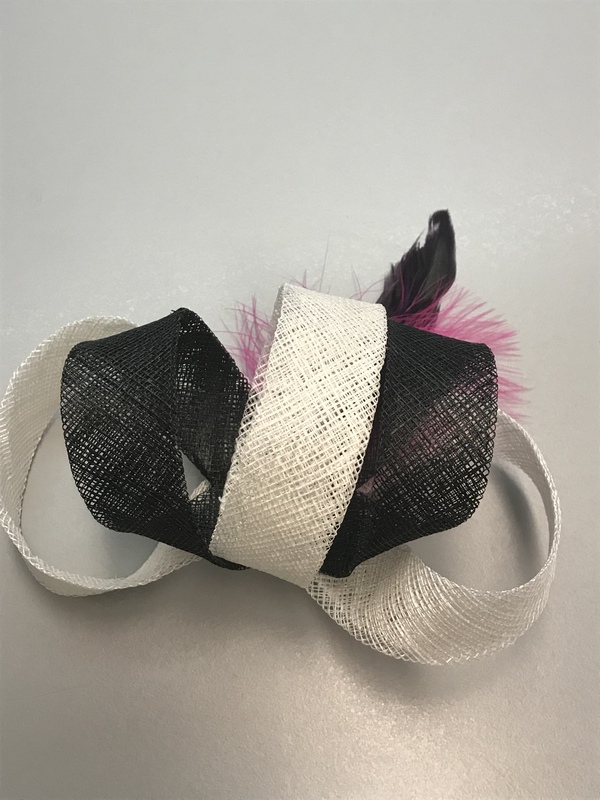 As her derby dress is purple, I knew that the color would be hard to match so I decided on a black and white theme instead for it. I used the first pattern in the book, Mariella for her hat. Since it was to be my first hat, I decided to go easy and I bought the sinamay bias from an Etsy store. The pictures in the instruction are well done. 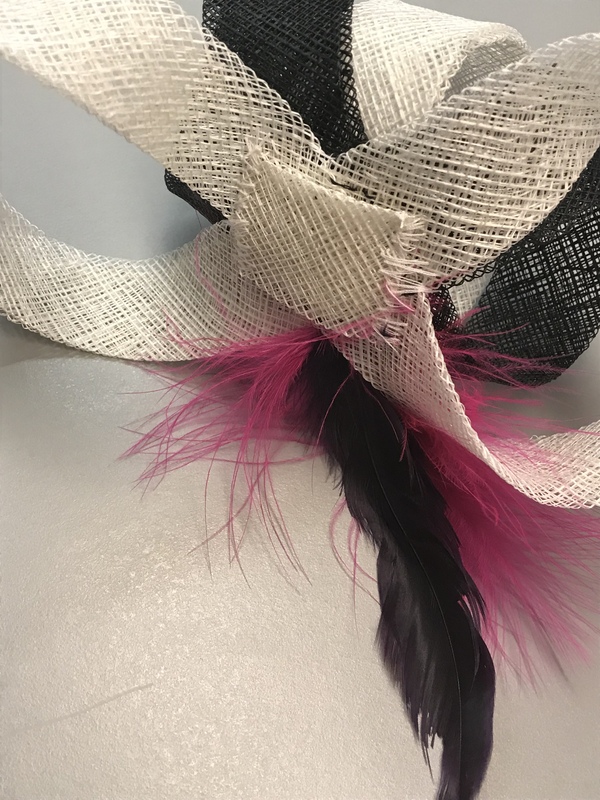 I used two colors so my Mariella fascinator came out similar but not exactly the same. I found that it was easier for me to make a complete loop then twist the loop into the figure eight and sew. After I had the larger white loop and the black interior one, I sewed them stacked together. The smallest white loop is the last piece put on. I overlapped the white bias and sew the overlap together. The book suggest that this pattern is easy and will take about an hour to complete. The easy skill level is very accurate. However, the hour to complete may be very optimistic. I think I probably have been closer to 3 hours. Some of that is trying to determine if the loops look similar to the pattern and changing it from 1 color to 2 colors. Another part of it is deciding the best way to put it on one’s head. In the end, between the hair stylist, my mom and me, we decided her short curly hair could use a clip or bobby pins. In the end, I hand sewed a small piece of sinamay to the back to slide either a clip or bobby pins in. Another sewing related item I did last year was to invest in nice hand sewing needles. I used a number 8 millinery needle from Tulip and that needle never bent at all. 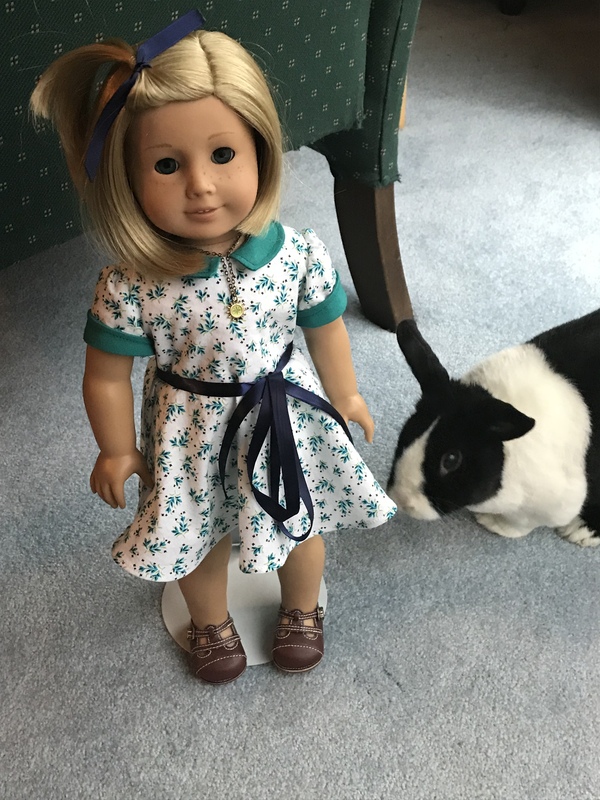 After a lot of consideration, I went with the circle skirt dress with contrast collar from Joan Hinds’ “Heritage Doll Clothes”. I knew that I had used the book several times already and always had a decent outfit afterwards. Pictures are behind just because it is harder to get great ones in winter; it was dark when I got home from work. This is using the same fabric as used for the K&R Vintage dress that didn’t come out well. The lining is some white quilting cotton. And I bought some navy ribbon to make the bow belt. After getting the ribbon, I realized the tiny dots are actually black and not navy like I thought. The only major change I made was to not use the bias tape for the finishing of the collar and sleeve cuffs. Instead I double cut the collar and the sleeve cuffs so I would have facings for them. The ribbon belt length was decided after the dress was completed and then I trimmed it after I got a bow that I liked. I was able to crochet a sweater for my Hearts for Hearts dolls! 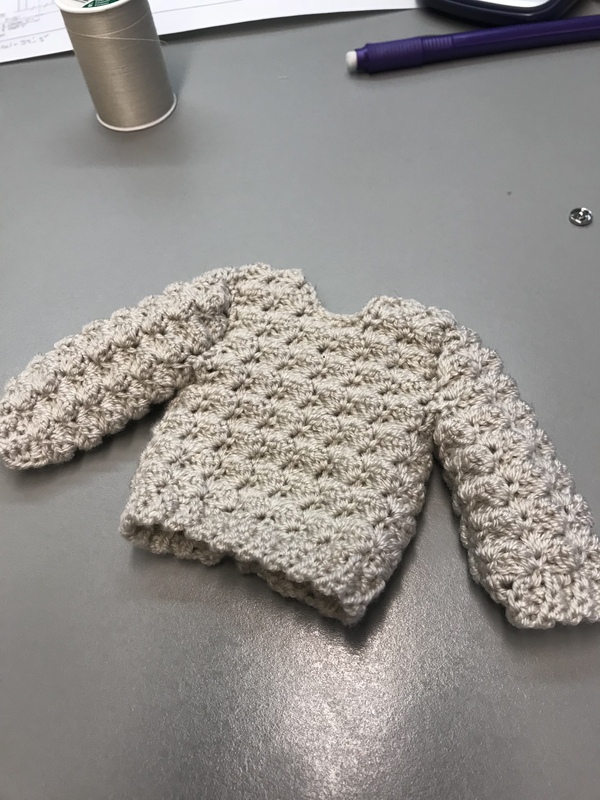 I used Sweet Pea Fashions’ “Cobblestone Sweater”. The Cobblestone sweater pattern is rated for advance beginner. This is probably correct. When I originally tried this, I did have some troubles with the single crochet ribbing. I would forget and add a single crochet to the turning chain one. As long as you feel comfortable making crocheted rows, this pattern wasn’t too bad. Also, don’t over think the crochet chart. I was confused when I went to do the shoulders sections if I was on the correct side. But following the directions, everything came out alright. 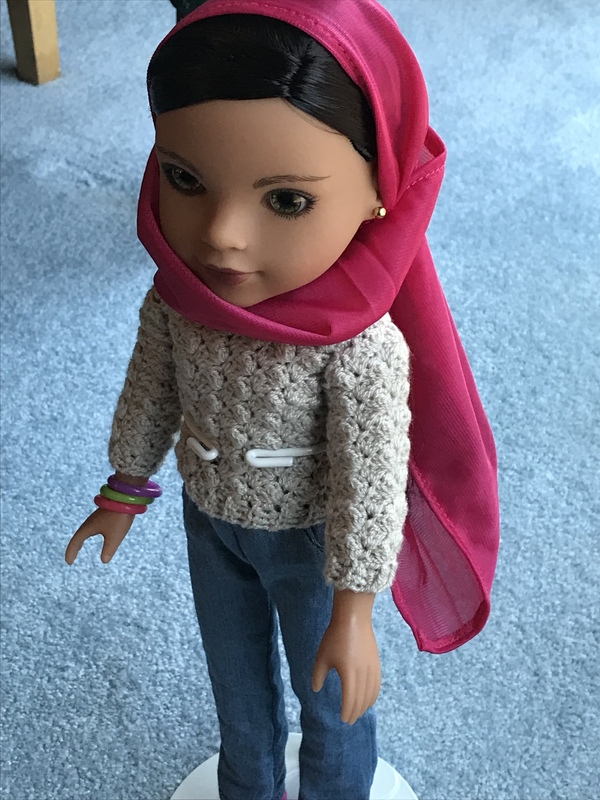 I started with the crochet hook (size C) recommend on the 14 inch doll pattern but realized when I was halfway through the ribbing that it would not be long enough. Since I had the 18 inch doll pattern also, I did compare the two and the 18 inch pattern recommends a size D hook. I used that and was able to get the recommended size shown in the 14 inch pattern. So I do believe that is a typo between the two patterns. 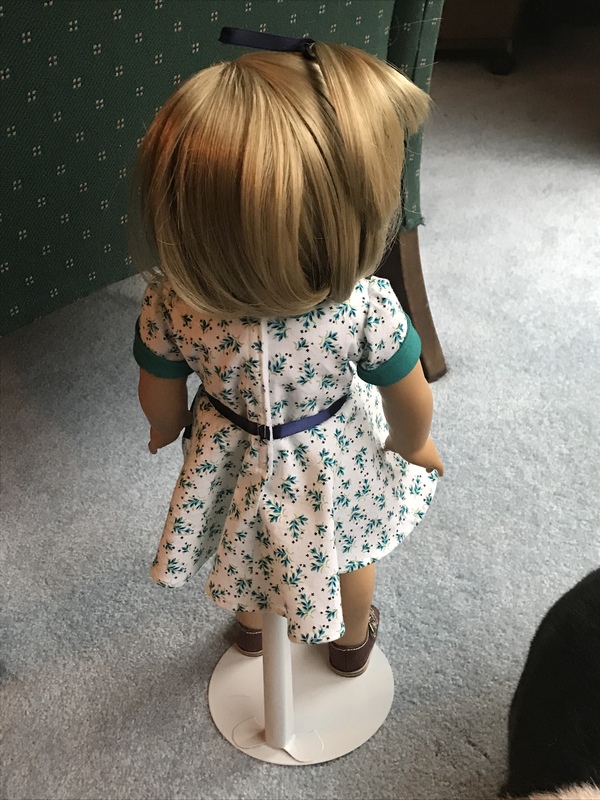 They both call for the same weight of yarn and the only difference I could tell was the length of ribbing needed to achieve the dimension required to fit the dolls. The back closes with three snaps. I think this would be easy to change-up into a sweater dress. I think it would require adding about 8 to 10 more rows of the pattern to get the length needed just so you can follow the pattern for the shoulder area. 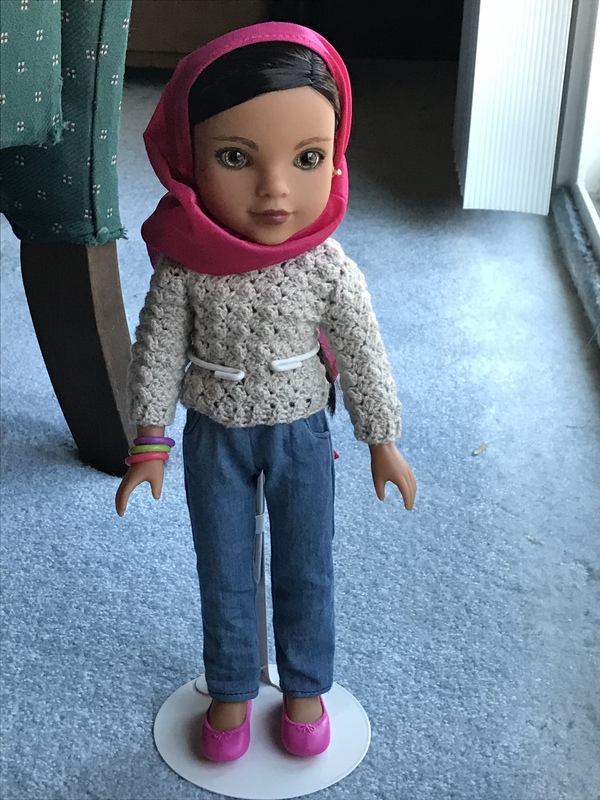 Over Christmas, I was able to make a couple of doll items. 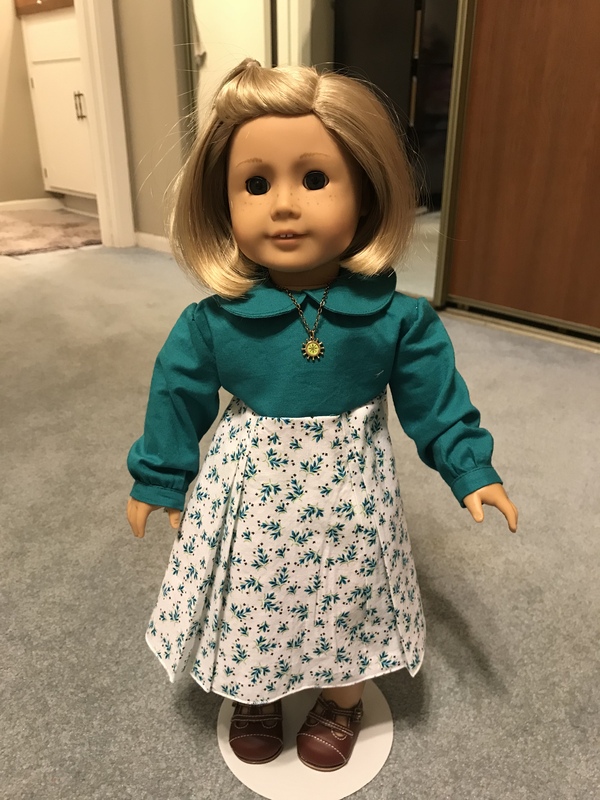 Keeping a less formal look, I decided on a shirtwaist, skirt and jacket for Marie Grace. 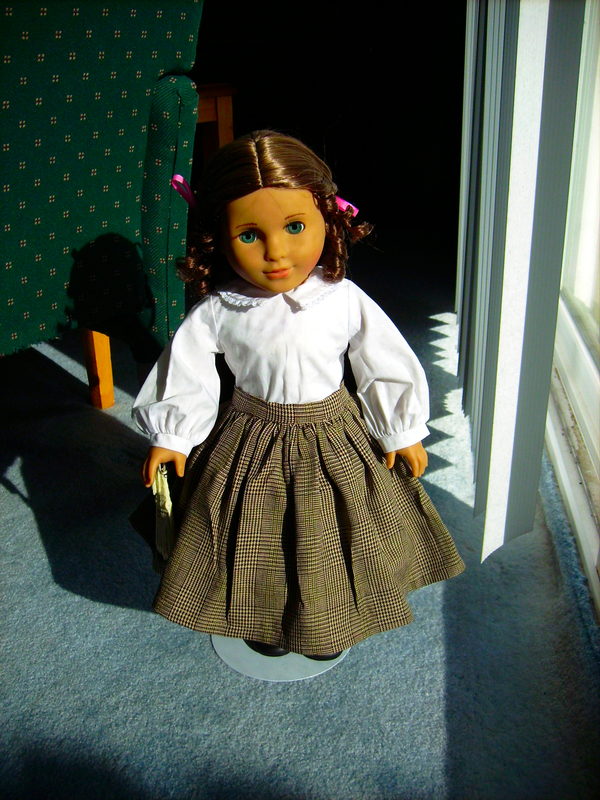 As of right now, Marie Grace only got her skirt which was from the 1860s School Outfit from Joan Hind’s “Heritage Doll Clothes”. 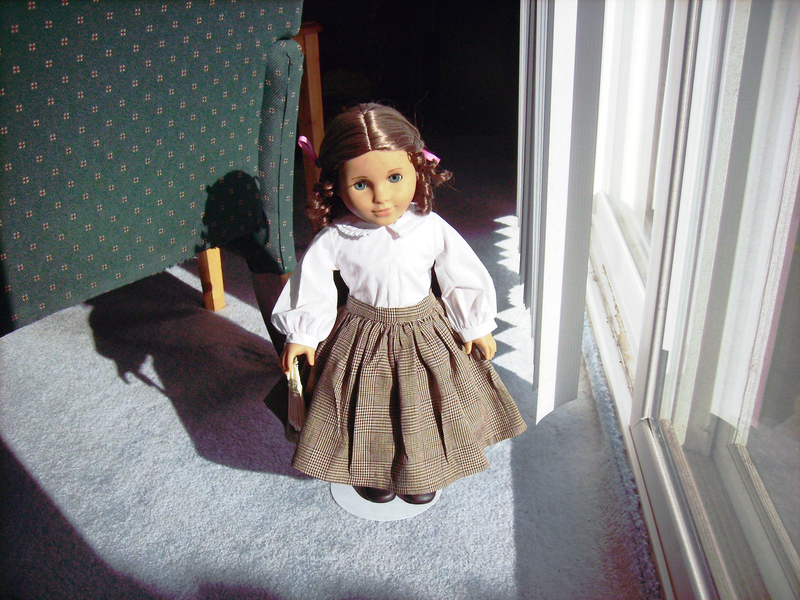 The skirt is easy to make and probably should have waited until everything has been completed. I didn’t make any changes to the pattern except for closure preference. 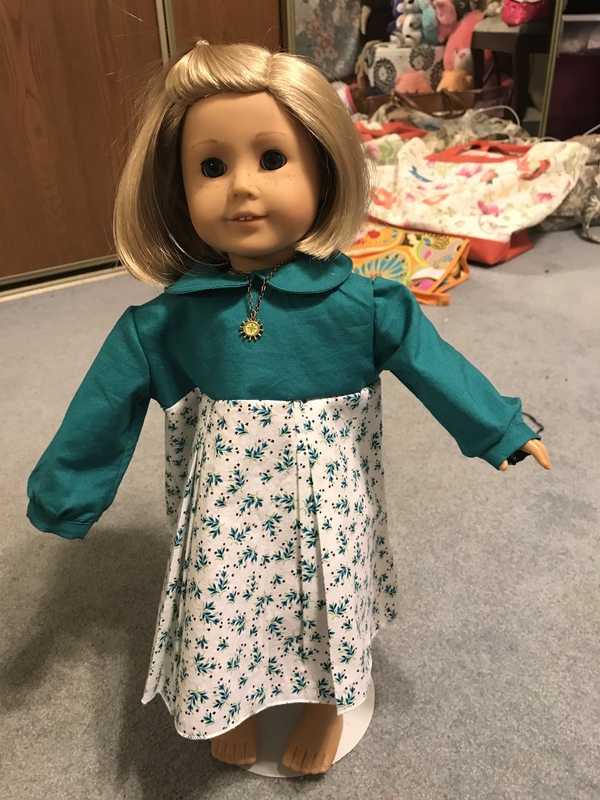 But realize that Marie Grace has her hoop skirt on underneath this skirt so the pattern works well on newer dolls with all the historical undergarments. I use a light weight suiting fabric to make the skirt and hook & loop fastener for the closure not the hook & eye requested.